Brand is a customer facing identity, represented by a collection of contact points for your customers. These contact points can include email support addresses, Help Center, Web Widget, Talk, Twitter, and Facebook. Brand is also a ticket value, added to all your tickets. Agents can manually change the brand associated with a ticket, and they search for tickets by brand. You can also use brand in business rules, including macros, views, triggers, and automations, as well as in Insights reporting. Your Zendesk Support has one brand by default, that was created when you set up your Zendesk account. Support for up to five brands is available on Enterprise. There is also Multibrand Add-on for Enterprise that enables you to add up to 300 brands. You must be an administrator to add and manage brands. For a list of resources, see Multibrand resources. When your account is created, one brand is created for you by default. So, before you add any brands, you have a single account subdomain and one brand subdomain that match. When you add brands, you still have a single account subdomain, but you have multiple brand subdomains, including your original brand that matches your account subdomain. When you have multiple brands, one is always assigned as the default brand. This is the brand associated with your default Help Center, and is applied in any situation where another specific brand is not indicated. The default brand cannot be deleted or deactivated until another brand is made the default. The default brand is also the brand retained if you downgrade to a single-brand plan. The default brand is identified as (Default) on your brands list. The account Owner can also define an agent brand, or agent route, which is essentially an agent's default brand. You select a brand for the agent route on the Settings > Account page, under the Branding tab. 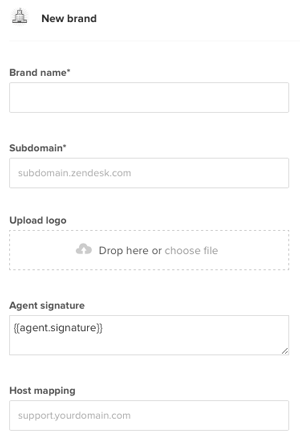 When your agents log in to Zendesk they see the assigned agent route, which is always tied to one of your brands. The agent brand cannot be deleted or deactivated until another brand is made the agent route. It is identified as (Agent) on your brands list. Note: Currently, you cannot change the subdomain of your original brand without also changing your account subdomain. Brand is a ticket value. Every ticket has a brand. Users and organizations do not have a brand value. They belong to the account, not a brand. You cannot segment users or orgs by brand. Most channels have a brand value, so that you can configure specific channels for specific brands. This includes Help Center, Web Widget, Talk, Twitter, and Facebook. Zendesk Support creates one brand for your account by default, but you can set up and support multiple brands. On Enterprise you can add up to five brands. With the Multibrand Add-on, you can add as up to 300 brands. You can watch this overview video or read the instruction below to add a brand. If this is the first time you are adding a brand, click Get started instead. Brand name is required and must be a unique name, not used by any of your other brands. This name will be customer-facing. Enter a Subdomain for this brand's Help Center. This subdomain will be the address (URL) for this brand's Help Center: mybrand.zendesk.com/hc. It will also be the default support address for this brand: support@mybrand.zendesk.com. Subdomain is required; each brand has its own subdomain. It can include only letters A-Z, numbers 0-9, and a dash (-). When you enter a subdomain you'll see notification that the subdomain is either available or already taken. (Optional) Add a Logo by dragging your file to the designated logo area or by clicking choose file. Your logo should be 2 MB or less and must be a PNG, JPG, JPEG, or GIF file. For best results, your logo should be square. Otherwise, your logo will be stretched or compressed to fit. (Optional) Enter a brand signature to append your agent's personal email signature when they are representing that brand. For information on agent signatures, see Adding an agent signature to ticket email notifications. (Optional) Enter an alternative support site URL in Host mapping to map one of your own domain names to the Help Center for this brand. For example, you might use support.mybrand.com/hc instead of mybrand.zendesk.com/hc. When you enter your host mapped URL it is automatically tested, and you'll see notification that your host mapping is either working or not working. Note: There are multiple steps required to set up host mapping for a brand, including generating an updated SSL certificate every time you add one or more brands. For more information, see Generating an SSL certificate for host-mapped brands. After you add multiple brands, host mapping is managed in Manage > Brands instead of Settings > Account. Your new brand is created and added to your list of all brands. Note: Your new brand will not be available to end-users until you add a Help Center or associate it with another channel (see Configuring your channels to support multiple brands). To manage your brands, see Managing multiple brands. To start using and supporting your new brand, see the next section Next steps after you add a new brand. When you add a host mapped brand, you need to regenerate your SSL certificate. If you do not regenerate your certificate, host mapping will work, but the brand will not be protected. Note: If you did not previously have host mapping set up, skip this section and go through the entire host mapping process. See Changing the address of your Help Center subdomain (host mapping). You need to regenerate your SSL certificate every time you add one or more host mapped brands, but you do not need to regenerate your certificate for every host mapped brand. For example, if you add three new brands, you need to regenerate your certificate only once. If you later add two more brands, you need to regenerate your certificate again. Your certificate request should be formatted as a SAN (SubjectAltName) cert. This type of certificate is used to manage multiple SSL-protected host mapped domains. Each brand subdomain is listed in the certificate as a SAN. Alternatively, You can use a wildcard certificate if your brands are in the same domain. For example brand1.company.com, brand2.company.com, and brand3.company.com are all in the same domain. To regenerate your SSL certificate when you add one or more host mapped brands, see Using hosted SSL. When you have multiple brands, every ticket has a brand. For all customer-facing channels, the brand is automatically applied to the ticket. When agents create tickets, they have the ability to chose the brand. You can require that agents select a brand before they submit a new ticket. If you do not require that agents select a brand, then your default brand will be applied to the ticket, unless the agent selects another brand before submitting the ticket. Click the toggle beside Require brand before save. Navigate away from the Brand settings page. By default, when you have multiple brands with active Help Centers, a list of all your active branded Help Centers are included in account emails. Account emails are system-generated emails that notify agents and end-users about their profile, including welcome emails, account verification emails, and password reset emails. If you do not want to include a list of your active branded Help Centers in account emails, you can exclude it. Beside Account emails, deselect Include a list of active Help Centers in account emails. When you add multiple brands, you have to add a Help Center, or associate another channel with each brand, before your customers can open requests with a specific brand. You can support your brands in any of these channels: email, Help Center, Web Widget, Talk, Facebook, Twitter, and the API. 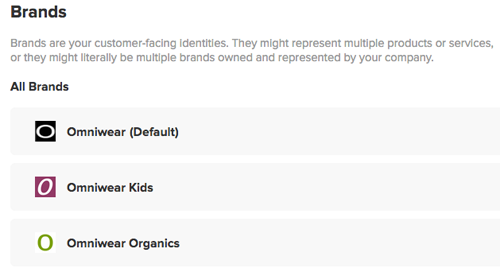 Note: Currently, Zendesk Chat does not support multiple brands (see Multibranding Zendesk Chat for a possible option). Is it possible to add each of our brand's separate logos into our email templates? So if we reply to a customer on Brand A, our signature should have that logo...Brand B, different logo? Looking for any solution, such as the email template, agent signatures, signatures at a brand level, etc. I think you can use triggers to do what you're trying to do. Is it possible to have multiple tiers of brands? We are quite a large company with 3 totally separate business units that each have multiple branding/products. If you're on Guide Enterprise you can have a separate Help Center for each of your brands if you'd like. If you're on Professional or lower, or you don't wish to use multiple Help Centers, you're a bit more limited. The Help Center only has three levels of content Organization for the Knowledge Base: Category > Section > Article. That said, you can definitely do some custom design on your Help Center to make a layout that separates your sections in a clear way. There is no way to require a Brand as it goes to the Default Brand unless changed. Please change this feature to allow turning off a Default Brand so it actually does force the agent to select a Brand on a ticket. Hello, We have an enterprise account with the multibrand option enabled. My team is building and supporting 2 totally unrelated brands with completely different URLs and no shared user base. The main reason for us to use multibrand is to make it easier for agents who will provide support for both services. Hi Darnell! Welcome to the Community! You can find the steps on how to do host map your brand domains in this Support Tech Note. Let us know if you need anything else! "You can also use brand in business rules, including macros, views, triggers, and automations, as well as in Insights reporting." I think this option doesn't show up unless you have already created the brands...have you done that yet? Hi Jessie, I have. We have seven brands... I just double-checked and everything's back to normal... Thanks for your assistance, though! I am trying to setup Hosted SSL for our zendesk account. It appears that this was done in the past by our previous administrator, however has since been disabled. What can I do to remove a brand without access to the brands tab? Hi Pedro! I'm glad everything's working for you. Let us know if you need anything else! We'd need to do some investigating on your account to answer that one. I'll be sending a Ticket your way and we'll work through it there. that's great. SSL can be installed to multiple brands at once. But for big brands that need SSL installation services to handle the after Migrating to HTTPS problems. Hey Jennifer, are we able to create Brand specific Guide knowledge bases? It depends on your Guide plan. No with Support Enterprise + Guide Lite or Professional. Yes, with Support Enterprise + Guide Enterprise OR Support Enterprise with Multibrand add-on + any Guide plan.